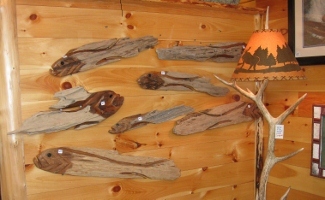 Owls Head Mountain Rustic Furniture, Keene, N.Y.
Just Two Miles West of Keene! 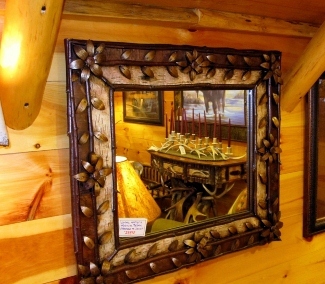 We have wall art to decorate your Adirondack Great Camp, vacation rental property, fishing cabin, or your "Adirondack Room" back in New Jersey. 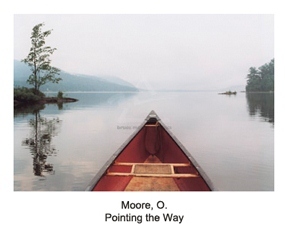 We have the perfect touch you have been looking for in fine framed artwork that will bring the amazing wilderness scenery of the Adirondack Mountains into your world. 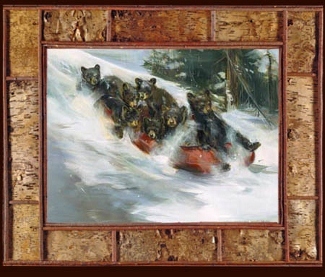 Our artwork includes many variations of the wildlife scenes that are prevalent here in the North Country with black bear, moose, coyote, loons, trout, raccoons, and deer. 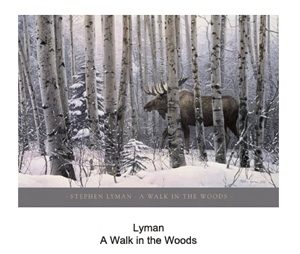 Detailed landscape scenes and breathtaking sunrises and sunsets bring nature to your doorstep. 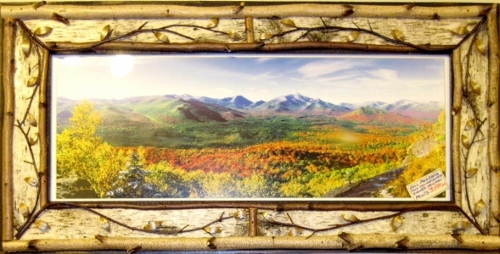 All of these fine prints are professionally assembled with double matting in combinations of earth colors. 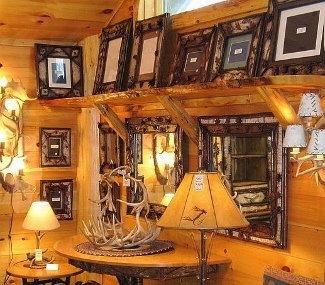 The picture frames are selected for their North Woods rustic appeal to compliment the nature prints perfectly and are securely wired for you to easily display. We have artwork ranging in sizes from 8" x 10" on up to 45" x 52", and because we know our framers personally and there are no middle men, we can sell our artwork at half the usual price. We are privileged to carry the exceptional artwork of Marilynn Mason. 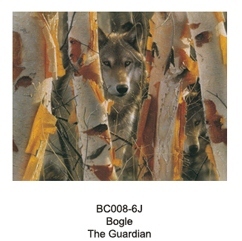 Her work has been exhibited throughout the United States and is represented in many private collections and galleries. 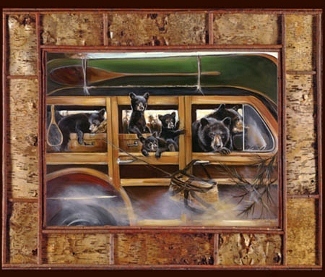 Painting from her own vivid imagination, Marilynn's artwork depicts outdoor adventures with our Adirondack creatures, capturing them in magical realism. The artist is proficient in pastel, watercolor, acrylic, oil, pen and ink. A number of Marilynn's paintings are available as limited edition giclee fine arts prints on canvas. 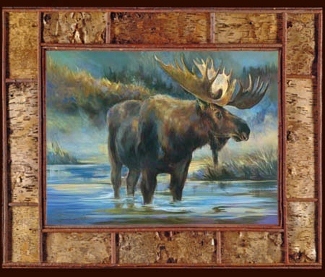 Each canvas is produced with the finest archival inks, hand stretched, numbered, and framed in beautiful large rustic wood and birch bark. Many of these are on display in our furniture gallery. 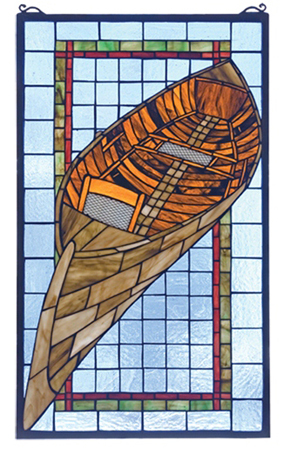 Real stained glass windows are truly beautiful with sunlight moving through the intricate cut glass pieces of rich colors and shapes, just like the beauty of a cathedral window. Most folks do not have that large a window area but you can certainly make a statement in your cabin or Great Camp with our window art. 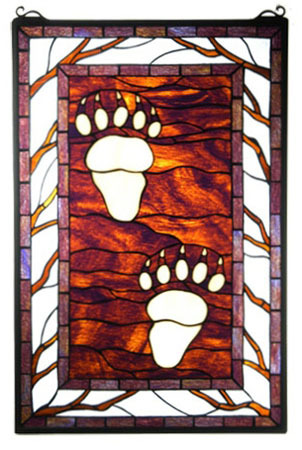 We have many designs in our gallery to show you with most displayed in outside windows to show you just how beautiful stained glass can be. 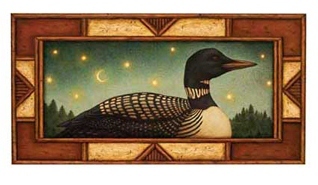 Choose a solitary loon swimming among the reeds or different scenes of guide boats with intricate cut glass showing the detail of the boat construction. 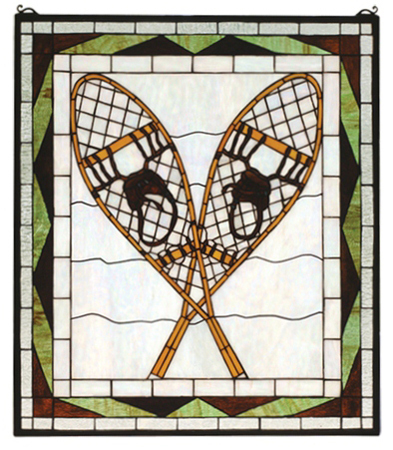 We have window glass bear tracks or our beloved Adirondack birch trees in a winter scene along with the traditional pack basket, fly fisherman, canoes, pinecones and snowshoes, all reflecting the North Woods beauty in genuine stained glass. 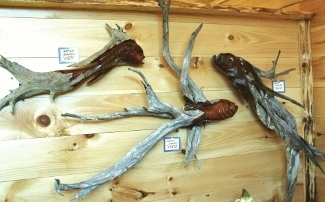 Our artist hunts for aged driftwood that is pulled from the mountain lakes and lichen covered branches that are foraged from the mountainsides. 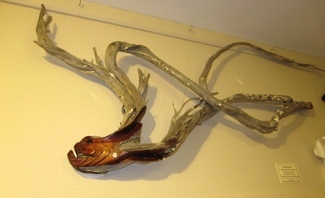 The roots and branches are then sawed, sanded, and shaped, and stained into beautiful flowing fish sculptures. Only one artist creates our wall art in this fashion and he spends many hours searching for just the right piece of wood that has aged beautifully. Hours of work are dedicated to turning every piece into a one-of-a-kind artwork that you will be proud to display in your home. 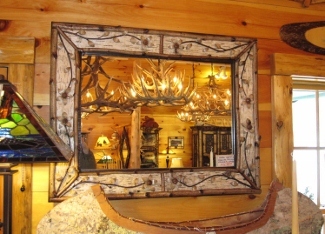 We offer a beautiful selection of birch bark mirrors and frames made by our very talented artisans. They create individual works of art and each one is different and unique. The mirrors and empty frames range in size from 8" x 10" up to 4 foot and 5 foot and we have over 50 pieces on display in the gallery. All the materials used to design and trim our mirrors, frames and hutches are foraged from the Adirondack Mountains and much of it comes from our 72 acres here in Keene. Twigs, acorns, lichen, berries, mosses, pinecones, and birch bark is also gathered from our local woods. These artisans build the frames themselves in many shapes and sizes and use only high quality distortion-free plate glass mirrors. Many hours of work are spent on each piece to create a one-of-a-kind heirloom that you will be proud to have in your cabin or Great Camp. Copyright © Owls Head Rustics - All Rights Reserved.